Dr. Damin Spritzer has been Assistant Professor of Organ at the University of Oklahoma since Fall of 2015. She is Artist-in-Residence Cathedral Church of Saint Matthew in Dallas and was recently appointed Adjunct Professor at the University of North Texas. Her performances have spanned several continents and included historic churches and instruments such as the Nicolaikirche in Leipzig, Germany; Sainte-Croix in Orléans, France; at Igreja Nossa Senhora de Fátima and Paróquia Nossa Senhora da Boa Viagem in Sao Paolo, Brazil; the La Verna Festival in Italy; the Terra Sancta Festival in Israel; Methuen Memorial Music Hall in Massachusetts; New York City at St. Patrick’s Cathedral; the Walt Disney Concert Hall in Los Angeles; the Piccolo Spoleto Festival in Charleston, South Carolina. René Louis Becker (1882-1956) was the topic of her doctoral dissertation. She edits a continuing multi-volume critical edition of Becker’s organ music. Spritzer’s first two discs for Raven Recordings (Richmond, Virginia) are world-premier discs of Becker’s music in France. The first was recorded in Pithiviers, France, in 2010 at the newly renovated historic Cavaillé-Coll organ of the church of Saint-Salomon-Saint-Gregoire de Pithiviers. Choir & Organ magazine gave it five stars. Dr. Spritzer has been heard on Michael Barone’s nationally-syndicated radio broadcasts Pipedreams and With Heart and Voice. 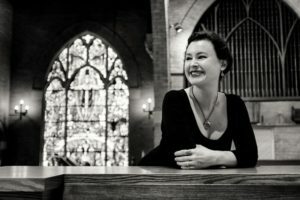 She received her doctorate from the University of North Texas, her Master of Music from the Eastman School of Music, and her Bachelor of Music from the Oberlin Conservatory of Music.